(all of this puts at too great length what FlipChartRick’s greatest Venn Diagram of the Coalition period says in a single picture. Economists cringe at this sort of thing, as it badly confuses levels and rates of change. To illustrate, consider someone slowly bleeding. Anyone can lose 10% of their blood and be fine, apparently. At 20%, you feel serious symptoms: faster heart rate, feeling cool, looking pale. At 30% shock comes in and general confusion. At 40%, risk of death. If someone said “I lost 10% of my blood in the last 10 minutes. I’m fine! So I think I ought to be able to keep this going for a half hour or so … ” they would be confusing the rate of change with the level. It is the level that is going to kill them. But given the way AME is expanding (debt interest, pensioners promised the triple lock, etc), this makes for far too optimistic a picture of what will happen to actual public services. This following chart failed to divide through by potential NGDP – it is a breakdown of that Pink line above. It shows what happens when protected areas are taken out. That bottom green line is worth zeroing in on: The previous low was around 1998. What I found was that unless something changed – tax, borrowing, other protections, some stroke of luck – these essential departments that on average had received 9% of GDP, were on course to get 4.5%, within the next Parliament. 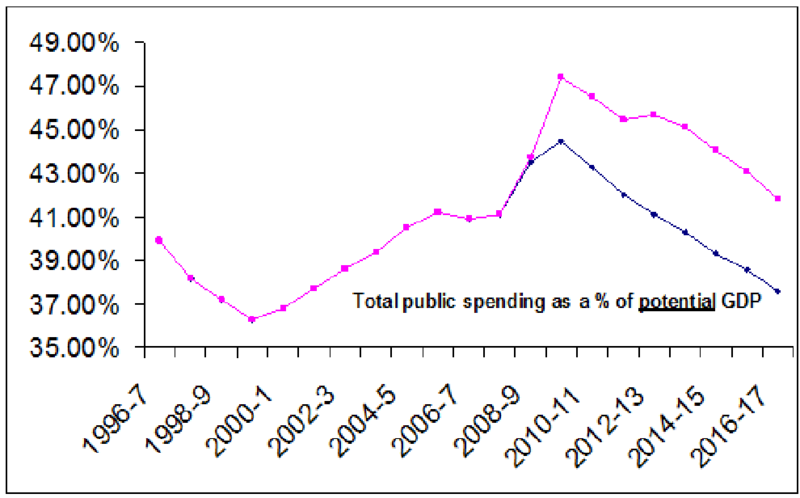 The unprotected spending that fell 2-4% per annum under the Coalition starts instead getting 7-12%. To stop it doing so, you would need to allow RDEL to stay steady at £315bn or so. 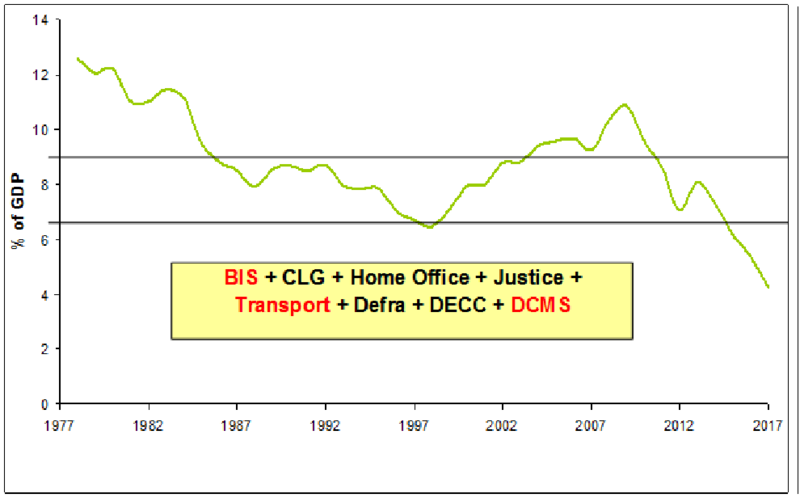 But even if you did that, cash protecting MOD etc would lead “the rest” to continue to collapse by 7% per year or so. And that is before considering my bloodletting analogy. Departments that need at least £75bn in 2015 cannot get by on £50bn in 2018. They probably need MORE than £75bn. For my last few months I asked every friendly expert I could meet: do you think the figures in the latest OBR report that suggest there will be less than £300bn of RDEL spending in 2018 are credible and achievable? I never met anyone who would say yes. Mostly they looked on me as some sort of naif. I remain slightly confused at why the OBR itself doesn’t say this. UPDATE. A correspondent has pointed out how the RDEL figures for this table and those earlier indicating the parties’ different plans are slightly different. It makes a big mistake only for the last year. For clarity, here is a table where the RDEL figures add up to that Conservative scenario. Sorry for the confusion. You can see that “the rest” is still dealing with ludicrously small sums in 2018-20, so the original points stand. Yet Norway has been suffering the austerity of only 30% of gdp being spent by the state without “bleeding to death” yet. OK according to that figure Norway is 43% not 30%. Perhaps I was wrong. But if so the UK figure is 48.5% not the 41% you show. Hmmm. Indeed the UK is, after Sao Tome and Micronesia, almost the furthest in the world to be bleeding to death (in fact one might conclude our state sector is bloated with our blood). And yes I would have to agree that Singapore is a country that hasn’t bled to death either. Indeed looking at that list, while the correlation isn’t close to exact, the trend is that the low state spending countries are growing and the highest aren’t so much. The only thing stopping economics being a real science is the number of “economists” eating out of the public trough, whose careers depend on ignoring the facts. There is then the intergenerational question and a subsidiary one which I am concerned with which relates to costs of energy and that impact on the economy although oddly enough Solar could be quite helpful. And their alternative choice is what exactly? Spend it themselves, generate tax revenue thereby shrinking the deficit? If they’d done that already then there wouldn’t be a deficit in the first place. I think perhaps you may have your causality upside down. The deficit is *caused* by people wanting to save, and the government obliges by issuing Gilts as savings instruments.